Vintage Adventurer | 2 Weeks to Off! 24 Sep 2 Weeks to Off! 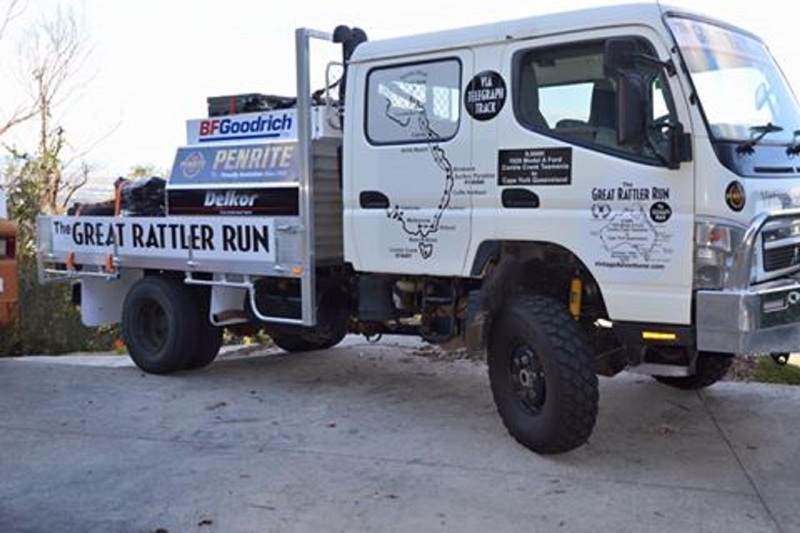 It’s now only about 2 weeks until I leave home and set off for Tasmania with the Rattler. So I thought it was about time I updated everyone on all the preparations for the next adventure. Look at the Fuso – isn’t she looking great! She is one of 3 support vehicles that I’ll be taking with me on The Great Rattler Run. This week, I took the Fuso 4wd to Graffiti Stickers and had them attach all the stick-ons and then returned to the workshop to screw on the logos that were attached to alloy, Penrite, Delcor and BF Goodrich. All the support gear is now stacked on the truck and secured for the journey. Next week, I’ll be fitting the big single tyres (same as the front ones) to the rear which have been donated by BF Goodrich. Big thanks to Rebecca from Michelin/BF Goodrich Melbourne, who sent these to me for the Rattler. I was all coffeed up and at Tyre Plus Burleigh talking to the big boss Craig Jones. 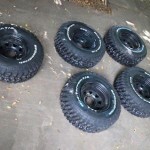 These tyres are for the far north in Queensland for mud, slush and creek crossings. They are so big that they will float the back of the Rattler where the drive wheels are. So I’ve been thinking about a solution that will see that the tyres do grip on the sandy bottom of the creek crossings even when in a meter of water!!! I’ll let you know how that goes when I’m on the track…….. These are huge indestructible tyres that the army use and are difficult to obtain. But it is sure worth the effort to source these brutes as the truck has to follow me up the old Telegraph Track in the Cape! With Michelin/BF Goodrich being sponsors that made the job so much easier!